The digital climate is changing every day. As the creator of digital tools for a global audience, our team at Anguleris has to constantly monitor and adjust to shifts in the technology tides. One of the main trends we are always monitoring is the usage and support for the most popular web browsers. As both the personal and professional worlds have moved increasingly more of their digital activities into the cloud throughout the past decade, the web browser has become perhaps the single most important tool on any computer beyond its operating system. We view email, host web conferences, watch videos, share files, and collaborate in real time from within a web browser. Incredibly complex processes that would have seemed impossible just a few short years ago are now just another tab in our browser of choice. Right in alongside each of these processes comes the BIMsmith platform. 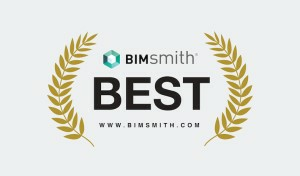 For building professionals all around the world, BIMsmith is one of those tabs. 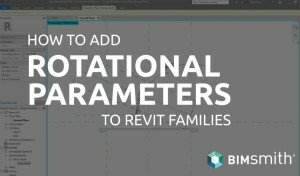 Whether it's building a series of floors, walls, ceilings or roofs in BIMsmith Forge or browsing for Revit families on BIMsmith Market, BIMsmith is built entirely for use in the cloud. That means that web browser support is incredibly important to all of our operations. That's why we keep a close eye on browsing trends. As new browsers emerge, we need to begin to support new protocols. As old browsers get retired, we need to create processes to help users on legacy versions still be able to use our tools. Below are a few key data points on global browser usage today, and why we've chosen to support the browser versions that we do. Surprising to many people is the size of the gap between Google Chrome and all other web browsers. As is clear in the following chart, in 2019 Google Chrome accounts for more web browsing than every other internet browser combined. 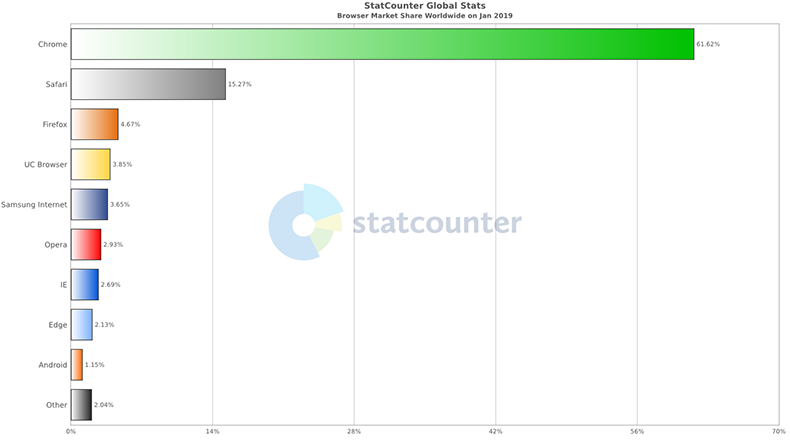 The trends over time in global usage appear to be headed in the favor of Google Chrome. From 2015 to 2018, Chrome saw the largest period of growth, while Internet Explorer began to decline sharply. In fact, the following chart almost makes it appear that Chrome may be responsible for the decline in Internet Explorer. However, as we will discuss next, this growth on Chrome's part is less likely a cause of the decline of Internet Explorer as it is the result. Internet Explorer has been in a downward spiral for a number of years. In 2016, Microsoft made the unsurprising announcement that it would be discontinuing support for all but the latest version of Internet Explorer. The announcement accompanied a push toward its new browser, Microsoft Edge. Edge was designed to be the modern equivalent of Internet Explorer, which dates back all the way to 1995. It promises faster-loading pages and fewer required resources, extending battery life. The company decided to maintain its commitment to the security and support of Internet Explorer 11 (the latest version to be released in 2013), but retired support for all other versions in place of Edge. Interestingly, Microsoft not only encourages users of Windows to use the pre-installed Edge browser in place of Internet Explorer but goes so far as to deliberately advise against using IE. 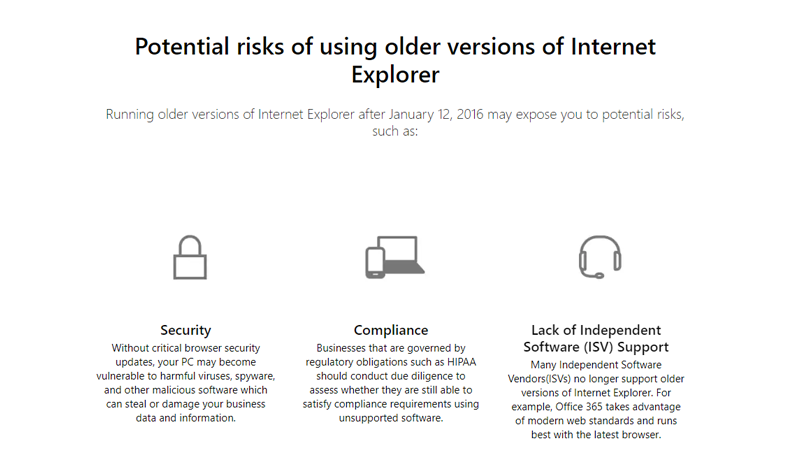 Since the retirement of all versions of Internet Explorer preceding v.11 in January of 2016, Microsoft has warned that using older versions of IE leave the user potentially exposed to risks involving security, compliance, and third-party software support. Microsoft has also already stated that support for IE 11 will end after the life of Windows 10. While this may be a few years out, the death of IE for good is not far into the future. All of this makes it clear that Microsoft is dedicating the bulk of its resources towards Edge and other projects. The resources dedicated to Internet Explorer are undoubtedly a sort of life support for an aging tool. For that reason, the BIMsmith team finally made the tough decision to focus its efforts on platforms that promise stronger performance and longevity moving into the future. Rather than spending resources to maintain backward compatibility with aging browsers, our resources will instead be spent on innovations that are pushing the needle forward. This commitment will help BIMsmith continue to push forward aggressively as we innovate on behalf of the entire AEC industry. For the immediate future, most all of the tools provided by BIMsmith should still work properly on legacy browsers like Internet Explorer. However, in the case of small bugs that might arise while using outdated versions, the best solution is to try an alternate browser with updated support. 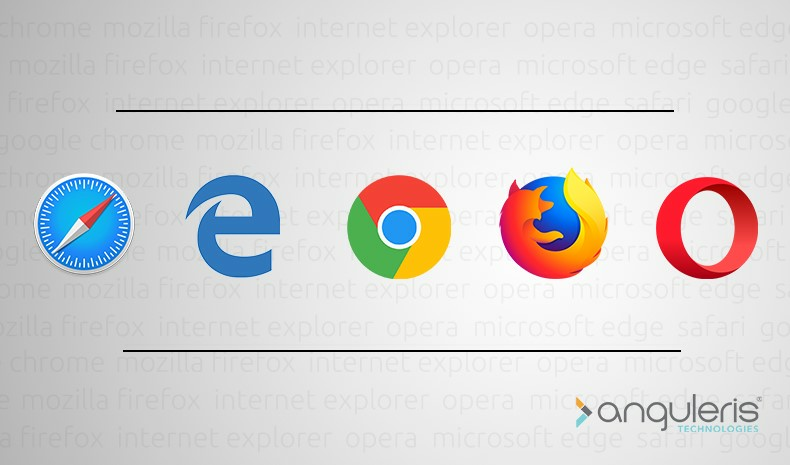 Below is a list of top browsers that we most recommend to use with the BIMsmith platform. If you do not currently utilize any of these tools, we have provided links to download and install them on your own computer. As always, our team is eager and willing to engage in discussion about emerging technology trends and uses. We'd love to hear your feedback! Feel free to comment below, send us a message, or chat with us on Twitter. And most importantly - happy BIMsmithing! 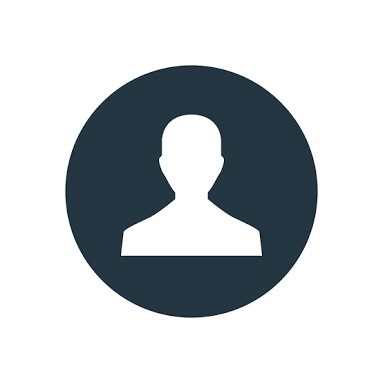 Get in touch to learn more about getting your products specified in Revit projects. Founded in 2010 by two architects who saw a lack of effective tools for architects to engage with the leaders in building products, Anguleris Technologies develops proprietary and custom technologies that bridge the gap between manufacturers and specifiers. 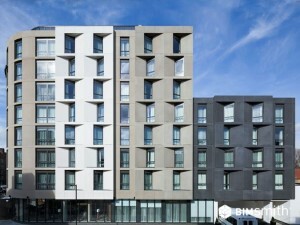 The creators of BIMsmith (including BIMsmith Market and BIMsmith Forge), Anguleris has unique industry insight into leveraging building product data for maximum return on your investment.